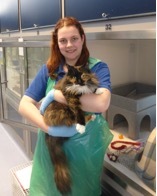 My name is Louise and I am a Cat Care Assistant here at the National Cat Adoption Centre. I help look after all the cats and help members of the public who are looking to adopt a cat. 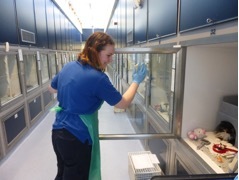 I have been working in one of our admissions wings, which is where all the new cats arrive. First thing in the mornings is to check that all the cats in the section are okay and that they haven’t had any problems over night. Our next job is to take any cats due for operations over to our Vet Clinic. Today we have got one cat going over to be neutered and another to have a lump removed from his foot. After we have done this we can start feeding the cats and give any medication that’s needed. Then we clean the inside cabins, before we go outside and clean the back runs where the cats’ litter trays are. We have a busy day with seven cats due to come in. When these cats arrive we take them in to our cat care room where we can check them over. We weigh them, clean their ears if they are dirty, trim their claws, microchip them and give flea and worm treatments if they are needed. It is always sad to see cats coming in to the centre. They come in for so many different reasons. The cats that came in today all came in because their owners couldn’t cope. We also get cats because they are strays or abandoned, the owners might be moving and can’t take them, or we get kittens that are unwanted litters. I spent time with a cat that came in yesterday who seemed quite nervous. She came in because her owner had died. After a while she settled a little bit and was starting to accept a fuss and was nudging my hand with her head for me to stroke her. At the end of the day we collect our cats from the clinic and make sure they are settled in their pens to recover overnight. We then feed and medicate the cats and count them so that we know they are all there! I love my job working with the cats, to see them when they come in to the centre and then to see them going off to their new homes with a family who will love them. I enjoy spending time socialising the nervous cats. I feel that it is so rewarding when I can bond with a cat and to see it grow in confidence and to know that I have helped that cat.